Grinding is an internal part of many welding and fabrication applications. 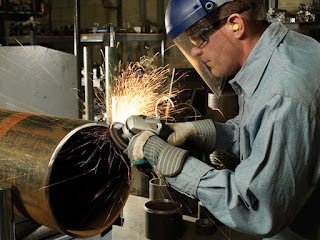 The grinding removes material, blend welds, shapes workpieces, and help prepare and clean surfaces, which can have a significant impact on the productivity, quality, and efficiency of welding jobs. Increasing the overall value of the labor put into a process can be done in two ways. The first is to ensure the product being used is right for the given application, which will improve productivity. Keeping the factors in mind, there are some product options, simple tips, and best practices that can help extend the life of the product and improve overall productivity. Grinding all day is tough job and users are often looking for options to extend product life or increase grind rate, or combination of both. When demanding jobs must be done quickly and correctly, choosing the right product for the application can make a tremendous difference for the operator and the performance. Grinding wheels and combination wheels are available in different performance tiers and compositions. Typically, those tiers are marketed as high performance (best), performance (better), and value (good) tiers. Within these general categories is a long list of specialty products, such as those designed not to contaminated stainless steel. Users need to think carefully about tools they use, the applications, the materials, the desired result, and their cost expectations so they can make the choice that is right for them. Bonded abrasives- grinding and combination wheels for the purpose of this article- rely on a composition of the grain type, grain size, fiberglass, and bonding agents (resins and additive fillers) to determine performance via a given material. Wheels come in a variety of grain types, including aluminum oxide, silicon carbide, zirconia alumina, ceramic alumina, and the combination of these materials. Bonded abrasive products made from different types of aluminum oxide are the most popular in the market and are good for many general purpose applications. Products made with a combination of ceramic and zirconia alumina, are higher priced in the market but will typically provide a better combination of overall life and material removal. This makes them a good choice for materials such as armored steel, structural steel, cast iron, and inconel. Some bonded abrasive wheels developed for high performance feature a fiberglass layer that is cut back, which means the fiberglass layer on the face of the wheel is trimmed back. This exposes the grains to more aggressive grinding action at the initial point of contact. When the jobs call for grinding and cutting, a combination wheel is likely the best choice. Do some homework before buying one, though, because not all combination wheels are created equal. Understand how many layers of fiberglass are on the wheel and where they are located. Also, ask if the wheel is rated for cutting and grinding or just light grinding. Many products will not hold up to a true 50/50 combination of both, so pick the one that best fits the application needs. These are just some of the considerations in choosing the right combo wheel. The type of product used can impact results in grinding applications. In addition, how the grinding wheel is used can also dramatically alter the results. Keep in mind some key tips and best practices to optimize outcomes in grinding. Start with a pull-back motion: when beginning the grinding process, start with a pull-back motion rather than a push. This automatically sets the operator more level, so he or she is not digging into the materials as much. Starting with a pushing motion could result in digging into the material too much, especially if the work surface is uneven, which could require a costly and time- consuming repair. Know the material: when grinding and cutting on general purpose steels, many product options will work, so try different products and see which one provides the best overall cost and performance value. When grinding stainless steel, look for a wheel labeled as INOX, which means its contaminant free and won't leave debris that may rust on the surface. This provides good performance and worry-free grinding on stainless steel. Use optimal angle and pressure: typically, a grinding wheel should be used at a 15- to 35-degree angle to the work surface for the best performance. Pressure and how its applied is also important. The user should hold the grinder in a tight fixed position and use his or her body during the grinding motion instead of just the arms extending out, or so-called alligator arms. This allows for consistent pressure all the way through the grind and also helps avoid overworking the user's arms. Match the size: when selecting the wheel size and material best suited for an application and the tool, operators can rely on manufacturer recommendations, product descriptions, and product rev/min rating to help make the choice. It's important to match the size and rev/min rating of the tool to the size and rev/min rating of the wheel for safe and effective usage. Always make sure the grinding wheel fits on the tool with the guard installed, and never remove the guard to put a larger diameter wheel on a tool. Improving the productivity of the process and maximizing the labor put into that process can be done in several ways. These include changing the type of the product used and changing how a product is used. Knowing what product options are available and understanding they're intended use is an important part of getting the best results. Keeping these considerations in mind when selecting a bonded abrasive grinding wheel can help ensure the product is best suited for the application.